St Oswald's Way is a 97 mile (155 km) long distance path which begins on the Holy Island of Lindisfarne and follows the footsteps of King Oswald along the stunning Northumberland Coast before heading inland along the Coquet River to Rothbury. From this traditional market town below the sandstone outcrops of the Simonside Hills, the Way heads south to Hadrian's Wall and it ends at Heavenfield, the scene of Oswald's victory over King Penda of Mercia and Caedwalla of Wales. On this self guided walk along St Oswald's Way you will encounter impressive castles, spectacular coastline, scenic river valleys, rolling hills, attractive villages, and old coaching Inns. You will walk on coastal paths, sand dunes and pebble beaches, along quiet riverside trails, on forest tracks and disused railway lines, across wild moorland and along the course of Hadrian's Wall. Prices are per person based on twin share and include all accommodation in twin share rooms on bed & breakfast basis, luggage transfer, information pack including map & guidebook and our emergency contact. Single rooms are available. We only apply a supplement for single accommodation when there is a direct cost to us and we cap this in line with our ‘Fair pricing’ policy. 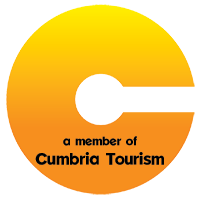 Solo walkers pay a supplement of £12 per walking day, plus any single room supplement which may be required. This itinerary splitting St Oswald's Way into six stages will suit experienced long distance walkers who wish to complete the route within a week. All the days on this itinerary are fairly long and you should be fit to undertake this option. Walking the St Oswald's Way in 7 stages is a popular choice, splitting the initial coastal section into shorter stages. There are still some longish days on the second half of the walk but this is a a good option for experienced long distance walkers. For those with more time to spare, this option will allow a more liesurely pace. Similar to the 8 day option except the remaining longish stage between Warkworth and Rothbury has been split into two shorter sections on this itinerary. If you have a fortnight to devote to this fantastic walk, this is our 'Explorer' option. With distances of 6 or 7 miles per day on the coastal section and a maximum mileage of 13.5, this option will allow plenty of time for visiting castles and churches, and exploring the villages, towns through which you pass in the course of St Oswald's Way. A Wandering Aengus information pack containing all necessary maps, a current guide book, laminated locator maps for each night's accommodation, and our own weather-proof 'info cards' with local information - including locations and opening times of restaurants, cafes, ATMs, supermarkets etc. Miscellaneous personal expenses such as drinks etc. As keen walkers ourselves we appreciate the importance of the place you put your feet up and rest your head in at the end of each day. We very carefully select our accommodations whether they be a cosy pub, family run guest house, or established town centre hotel. We choose places directly on the route or within easy walking distance of it and if we ever have to transfer you because of limited availability, we will always contact you to discuss this and never just leave you to find out later. We provide comfortable, clean and warm twin or double rooms, with private bathroom wherever available. Single occupancy of rooms is also available for a supplementary cost. Breakfast at your accommodation is included in the holiday price. In most cases your accommodation will serve dinner and will be able to prepare a packed lunch for you. Sometimes this will have to be arranged in advance and we will let you know if this is the case. Alternatively you can use our detailed notes to make your own dining and lunch arrangements using local restaurants, cafes and supermarkets. LINDISFARNE: Holy Island (Lindisfarne can be reached by road across a causeway which is submerged at high tide. Safe crossing times for the causeway are published at http://orawww.northumberland.gov.uk/www2/holyisland/holyisland.asp. You must plan your arrival accordingly – do not attempt to cross the causeway at any other time as the tides come in very rapidly and the crossing can become very dangerous. 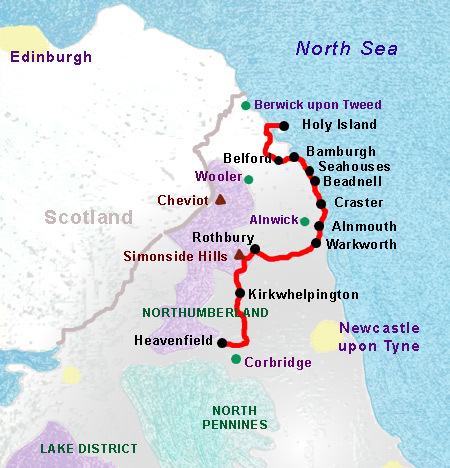 The nearest railway station for Holy Island (Lindisfarne) is Berwick-upon-Tweed (BWK) on the East Coast Main Line. There are hourly trains between London Kings Cross, Newcastle and Edinburgh. From Berwick-upon-Tweed Perryman’s bus service 477 runs to Holy Island (approximately 35 minutes journey time). The timetable for this service varies according to the tides and you should check the causeway safe crossing times before booking, or you can discuss this with us. You can also travel by taxi and there is a taxi rank outside the station. RETURNING FROM CHOLLERFORD / HUMSHAUGH: The nearest Railway Station is Hexham (HEX) on the Tyne Valley Line with a frequent service between Newcastle and Carlisle. The 880 bus service runs from Humshaugh to Hexham Railway station (journey time approx. 30 min) or we can arrange a taxi for you. St Oswald's Way is a moderate trail, full of history, beginning at the ancient priory on Holy Island and following the Northumberland coast along beaches and coast path past the impressive castles of Bamburgh and Dunstanburgh and the fishing villages of Seahouses and Craster. At Warkworth the coast is left behind and you follow field paths, lanes a riverside walk and through woodland to reach the market town of Rothbury on the River Coquet. Entering the Northumberland National Park, you then climb up onto the moors and the highest point of the trail, with spectacular views over the sandstone outcropping of the Simonside Hills. Descending via Harwood Forest you pass through a pastoral landscape to reach Kirkwhelpington, before continuing south through gently undulating countryside dotted with pretty villages. Finally, St Oswald's Way reaches Hadrian's Wall, which it then follows to its conclusion at Heavenfield.